If you want to get One Grip Higher buy a new shirt! I actually hate shopping. I am more likely to let my clothes get ragged and my shoes wrinkled then to go to the store and look for new stuff. But over the years I have learned that taking a shopping trip periodically can have some serious benefits. A buddy of mine in college always wore dress shirts. When I asked him why he said, “today might be the day I meet my future employer… or maybe my next girlfriend.” He was ready to make the best possible first impression before knowing whether or not he would even have a first impression to make. I’m not sure what happened to him… I bet he is successful! Another buddy of mine is a lawyer in NYC. He also wears a collared shirt every day, even on his days off. I remember wandering through the Metropolitan Art Museum on a Saturday together. I asked him why he was dressed for work on a non work day and he said, “You never know who we might meet today.” We didn’t meet anyone important that day. But over the past several years he has worked in prestigious law firms in New York, Dubai and London. He has traveled the world and worked with and met some really impressive people. Are you ready to make a first impression today that could change your life? Look in the mirror! Seriously, do it! Would you… hire you? How do you look? First impressions matter. A new shirt… a stylish one! Can actually make a real different. It’s not uncommon to hear that people buy a new suit for an interview. But actually, every day is full of lots of interviews, even if yo aren’t looking for a job. The people you work with are interviewing you every day. They determine how much they are willing to let you influence them based on how you look, act, and perform. Think about it… you do that same thing to other people as well. When I was first hired as a teacher in my current district 8 years ago, I met a retired teacher who shared with me a similar thought. He basically said to me something like is, “The kids will take you as seriously as you take yourself. If you want to get a lot out of them? Then treat the teaching profession as a profession! Dress up, work hard and put in long hours.” since then, I tend to wear suits more often than not. Not every day! But I am making a concerted effort to dress well. You only get one shot at a first impression. Make it count. Today I am a high school principal in the same district. And I still try to act and dress the same. Every day is an interview, even when you aren’t looking for a job. So here is the deal… Dress up more often! And not just wearing the old shirts. Go out and buy a new one. People will notice. You will feel great and probably put forth a bit of extra effort in whatever you are working on. I’m thinking you will find yourself One Grip Higher! 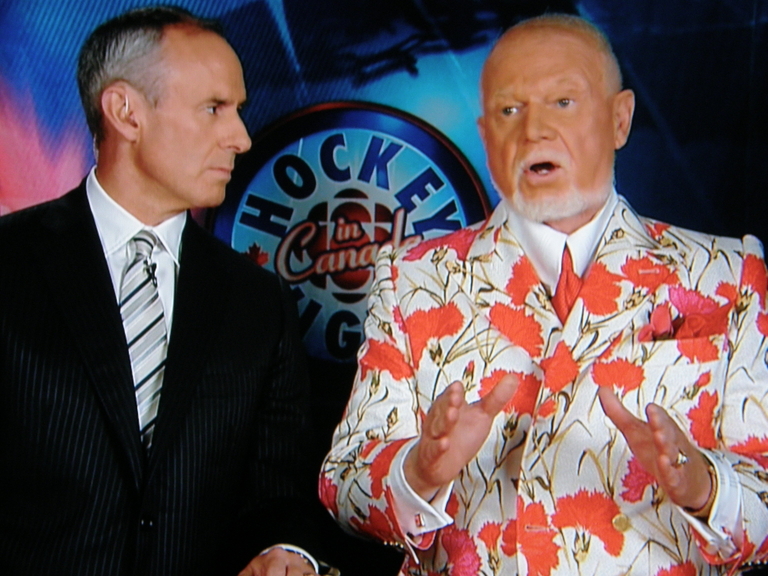 Completely unrelated to this posting... but when talking suits, you have to mention Don Cherry!